After a long winter hiatus, Hart of Dixie has returned and has amped up the anticipation, as Bluebell faces losing itself by merging with their sworn enemy, Fillmore. 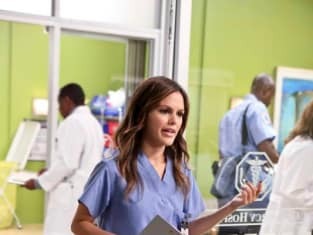 In Hart of Dixie Season 3 Episode 9, Tansy, Shelby and Rose return to help fill void that Lemon has left in her short absence, while Lynly's departure seems to be quite certain. In this installment, we got the feel of what Parks and Recreation had to face earlier on Parks and Recreation Season 6 when Pawnee merged with Eagleton. It seems like the conclusion of this event will end the same way for Lavon Hayes as it did for Leslie Knope; he'll lose his political power. For the record, I'm still heartbroken from Knope being recalled. I will also be heartbroken if Lavon will no longer be Mayor. After the dark twist in Hart of Dixie Season 2 of Wade cheating on Zoe, I wouldn't be surprised if Dixie recalled Hayes. Elsewhere, noticeably absent was the official troublemaker, Lemon Breeland. As discovered in Hart of Dixie Season 3 Episode 8, Lemon left to take care of her grandmother and will not be back for awhile. To help fill that vacant spot, three favorites were brought in: Tansy, Shelby and my personal favorite Rose. All three characters had completely different roles that were needed to keep the flow without Lemon. When Shelby first came into Bluebell, I didn't like her at all. Now? I LOVE her. I love her even more now that she is pregnant. Nothing would make me happier if her and Brick reconciled. I love them. End of story. As for Tansy, I LOVE that she is back, mainly because she is going to drive a wedge between Lynly and George. Quite frankly, I could care less if Lynly gets heartbroken. The only thing I didn't like about this episode was her and George, which has been my main complaint during Hart of Dixie Season 3. I have never enjoyed their pairing and I don't foresee me doing so in the future. You know what else I didn't like? Lavon trying to make George promise he won't break Lynly's heart. That was completely unfair for Lavon to do that. I understand why he did - she is his family and he is worried about - but come on. All of us, as viewers, know that Lynly and George will not last. Meanwhile, Rose returned and brought her young innocence back to Bluebell. She is so adorable and the fact that she thinks Zoe is the only adult she has to talk to. So cute. As Zoe proved tonight, she is far from an adult. Everyone, including Joel, knew she was jealous about Wade and Vivian dating. She can lie to everyone and say it was because she was worried about her family but we all know that was completely false. When will Zoe Hart stop lying to herself about her inevitable feelings for Wade? The worst part is, I love Joel and she will break his heart. Overall, this episode was a great start to the rest of the season. I look forward to where we are headed. I also love that we ended on a cliffhanger! What the heck is going to happen to Bluebell? Is it going to be Morebell now? Which character were you most excited about seeing return in the episode?